In their cosmogony, the Chitimacha recognize a Creator, Thoumé Kéné Kimté Cacounche or the Great Spirit. In the beginning, he placed the land under water, fish being the first animals. In order to have the land rise above the water, he ordered the crawfish get to the bottom of the sea and bring back to the surface. With this emerged land mass, he formed human beings and installed them in Natchez, their first home. This story has some parallels with Genesis, but it is important to note that among the local tribes, crawfish, this delicacy which occupies much of the culinary year in Louisiana, plays a decisive role in the creation of the world and mankind. The importance of crawfish for the original peoples in Louisiana cannot be overstated. The tribes of the Houma, whose totem it is, and the Chakchiuma, assimilated by other groups, were created by separating from an older tribe. They derived their names from their traditional language, a variation of Choctaw, part of the Western Muskogean family of languages. Chakchiuma means "red crawfish"quite simply. Houma is the word for red, as we see in Istrouma, red stick, or Oklahoma, red people. As for the new European arrivals, we like to tell another myth about the crawfish that is as fundamental as Evangeline, with which it has a close relationship. Everyone knows the story of the lobsters in Old Acadie who so loved the Acadians that they followed them during the Grand Dérangement, skirting the Atlantic coast, bypassing Florida and across the Gulf to arrive with them in the bayous of Louisiana. The trip was so long and tedious that lobsters lost weight, so much so that they shrank to the size of a crawfish. A beautiful story of course, but as the fact that crawfish were here long before the Europeans proves, it is as false as Longfellow's epic fable. In reality, crawfish are nowadays a major industry in the state and must face terrible competition from other suppliers, notably China. Louisiana accounts for over 90% of the current domestic production and supports thousands of jobs. Although people have always eaten them, it was not until the late 19th century that we began to market them. In 1880, the year of the first recorded harvest, Louisiana picked up 22,400 pounds of crawfish with a value of $2,140. Twenty-eight years later, that amount rose to 88,000 pounds representing $3,600. Think about that the next time you pay the check on a five-pound tray in your favorite restaurant. To be fair, we must say that before there was no cultivation in rice paddies or in simple ponds as is the case today. All you had to do was place traps in the wild with a little bait and then pick them up. The cost of operation has grown since. 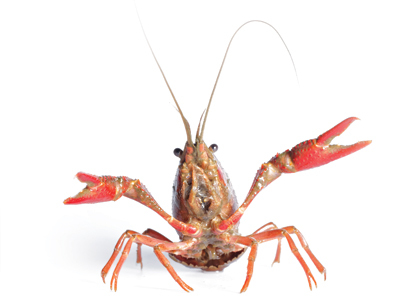 Today, more than 1,200 farmers produce 65,000 tons of crawfish each year with a value exceeding 200 million dollars. In his book "Louisiana Crawfish" Sam Irwin tells how the crawfish was considered poor man’s food for a long time in Louisiana. I have often heard the elders say that they ate them the last resort when there was nothing else, which happened often enough during the Great Depression despite our generous landscape. I know people who do not eat crawfish, but it’s more due to the fact they would prefer not to eat an animal that lives in the mud. In Louisiana French, they would be called "délicat". Nevertheless, attitudes have begun to change in 1959 with the founding of the famous Breaux Bridge Crawfish Festival. Several women have been crowned Crawfish Queen; in her world capital, the crawfish is the real queen. She has come a long way since the creation of the world. When you find yourself in front of a steaming pile of crawfish topped with boiled potatoes and corn on the cob, remember what this humble crustacean has contributed to the happiness of mankind since time immemorial.